It's the roaring 1920's. Players take on the role of Investigators into the unknown, who have travelled up into the nearby mountains to a remote mansion said to hold a terrible secret. Unfortunately, a vicious storm has blown in, trapping the investigators and knocking out both electricity and telephone. They are trapped. Worse yet, there are those among them who have fallen prey to the worship of the dark gods they once sought to stop, These Cultists have been quietly biding their time until they could strike - and that time is now! 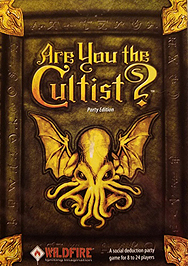 The Party Edition requires from 8 to 24 players, and is based on the popular party game from the USSR known as Mafia (also as Werewolf or Assassin), with its own new twists. It's Role Madness - there are no "vanilla" characters!